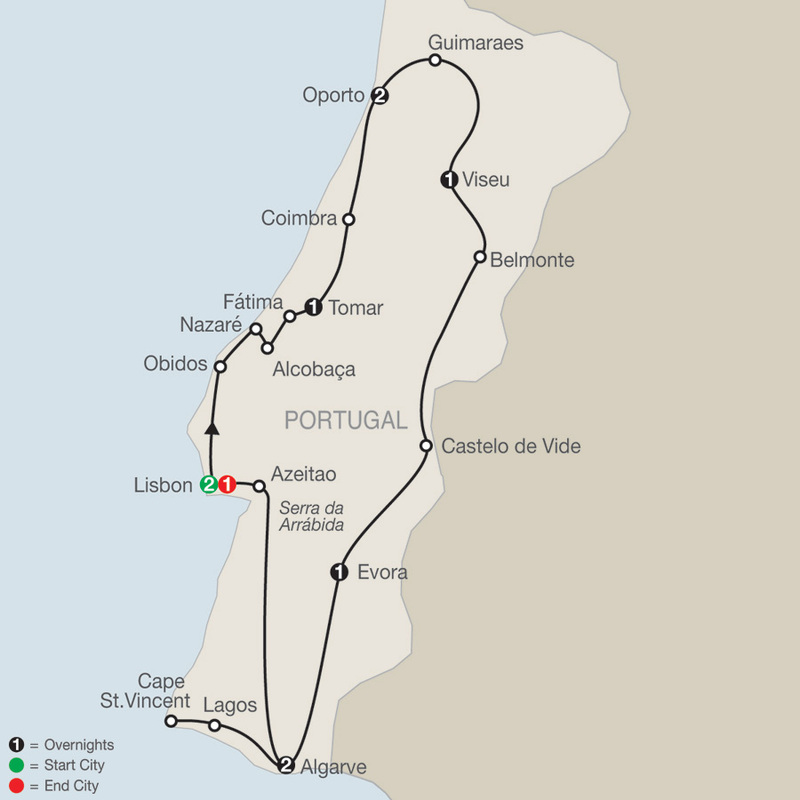 Anyone hoping to visit Portugal will be pleased with the Globus tour offerings in this region. Depending on which tour you select, you might stroll through Lisbon's longstanding Jeronimos Monastery, visit the Roman ruins of Conimbriga and its nearby archeological museum or tour Henry the Navigato's Promontory of Sagres near Cape St. Vincent. You might view a 13th-century castle in the charming town of Belmonte or stop at the mystical city of Fátima. 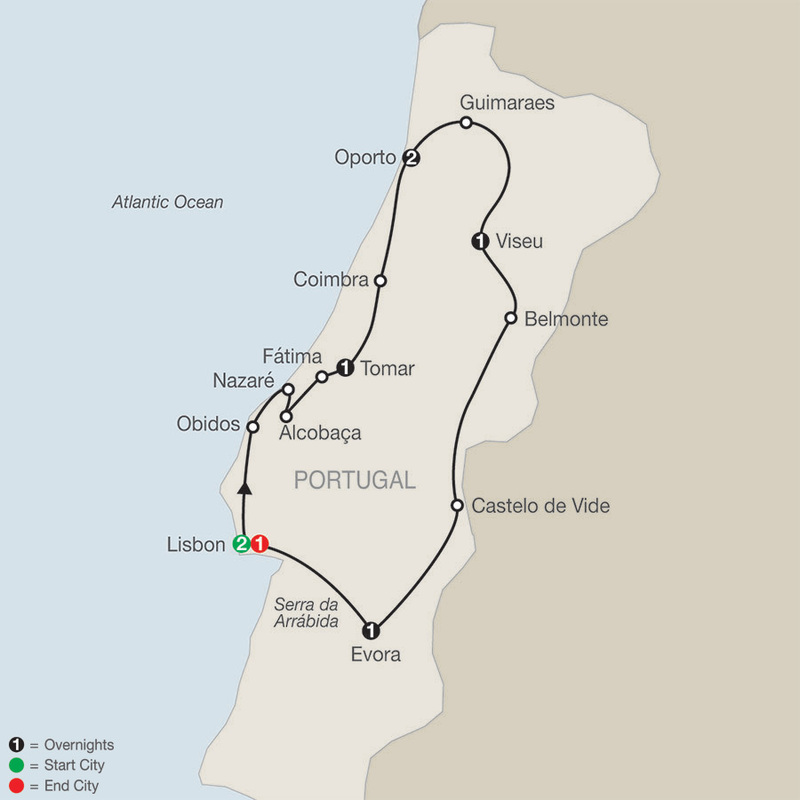 These vacations showcase the most popular cities in Portugal and surrounding countries. They showcase the area's most famous landmarks year-round. With excursions ranging in length, rate and itinerary, there is certain to be an offering for any preference. This marvelous vacation offers two-night-stays each in Spain’s and Portugal’s most famous cities: Barcelona, Madrid, Seville, and Lisbon, with guided sightseeing including the most popular sights. Fans of art and architecture are sure to be delighted by the visits to ...Read More. 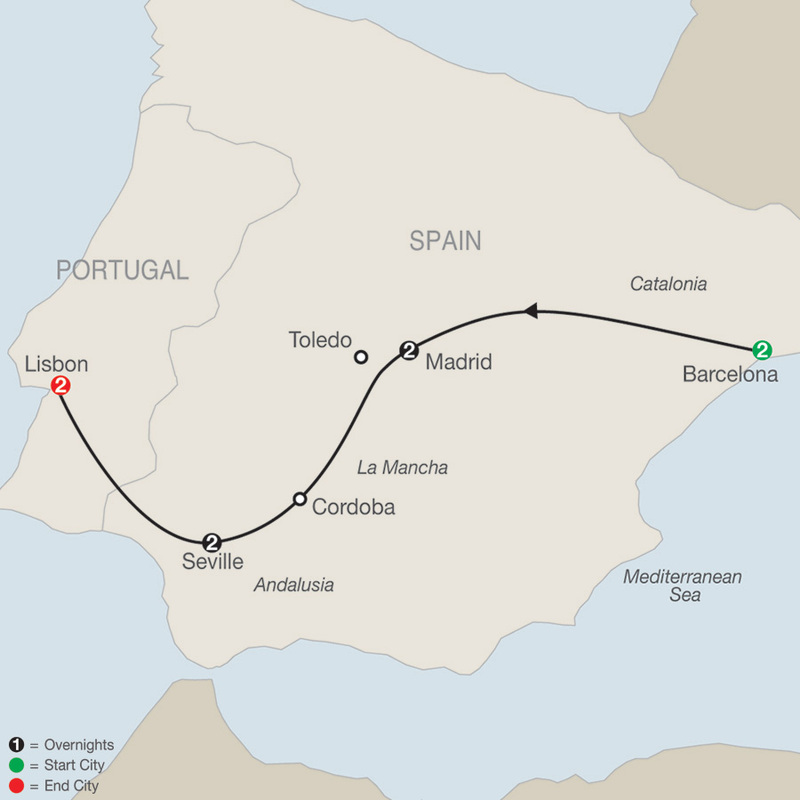 This vacation shows you all of Portugal at a relaxed pace, thanks to the well-planned two-night stopovers in Lisbon, Oporto, and the Algarve, and overnights also in Tomar, Viseu, and Evora. 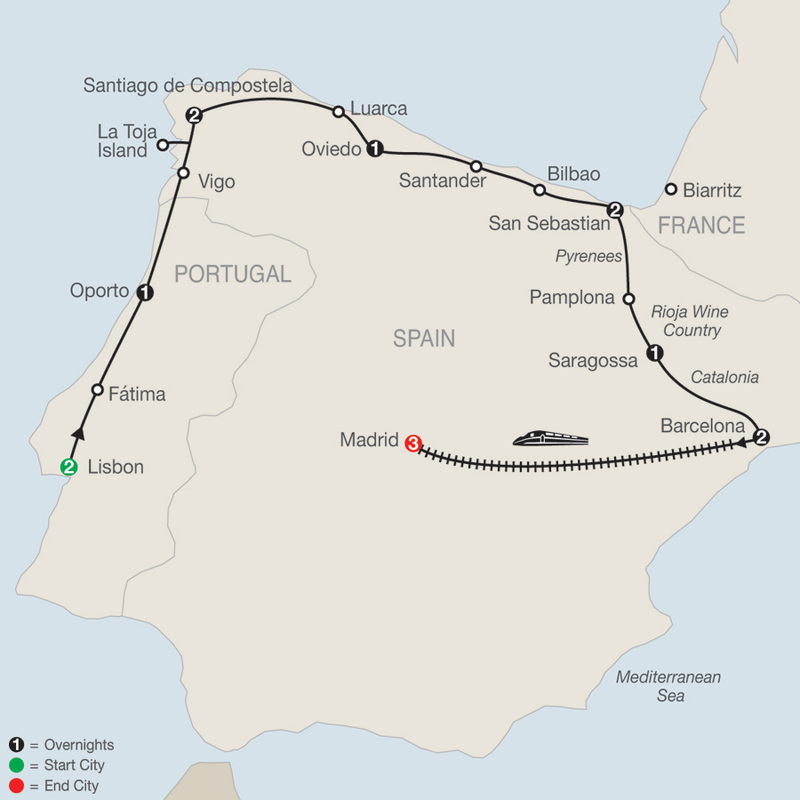 Start and end in Lisbon, and see the interior and almost the entire coastline of ...Read More. 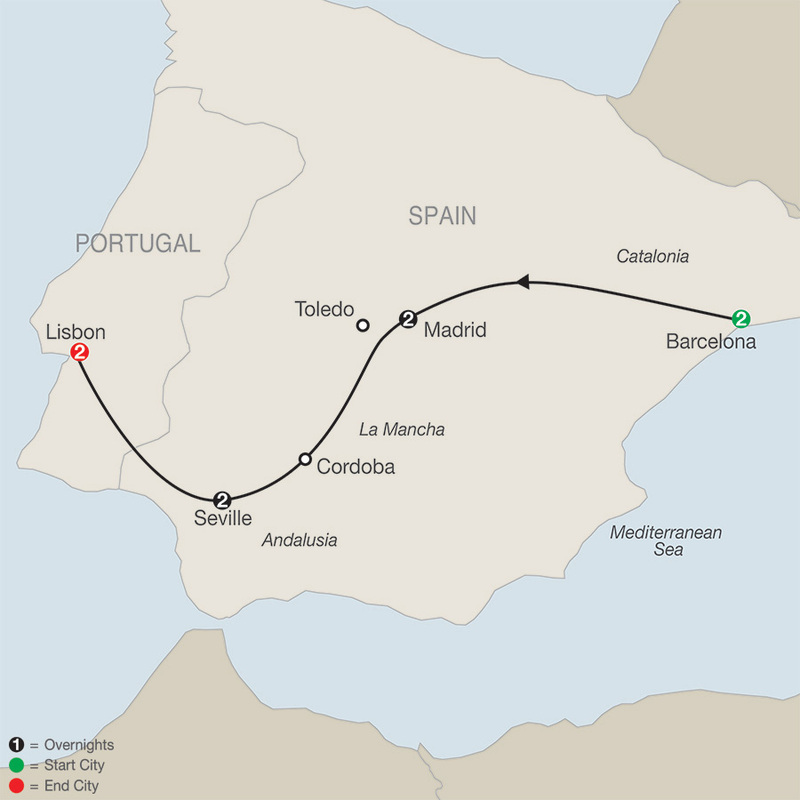 Explore the coastline of Portugal and Northern Spain on this fascinating vacation. In Portugal, you'll overnight in Lisbon and Oporto, and enjoy guided sightseeing in both cities, including the Jeronimos Monastery in Lisbon, dating back to the 16th century, and in Oporto, the ...Read More. 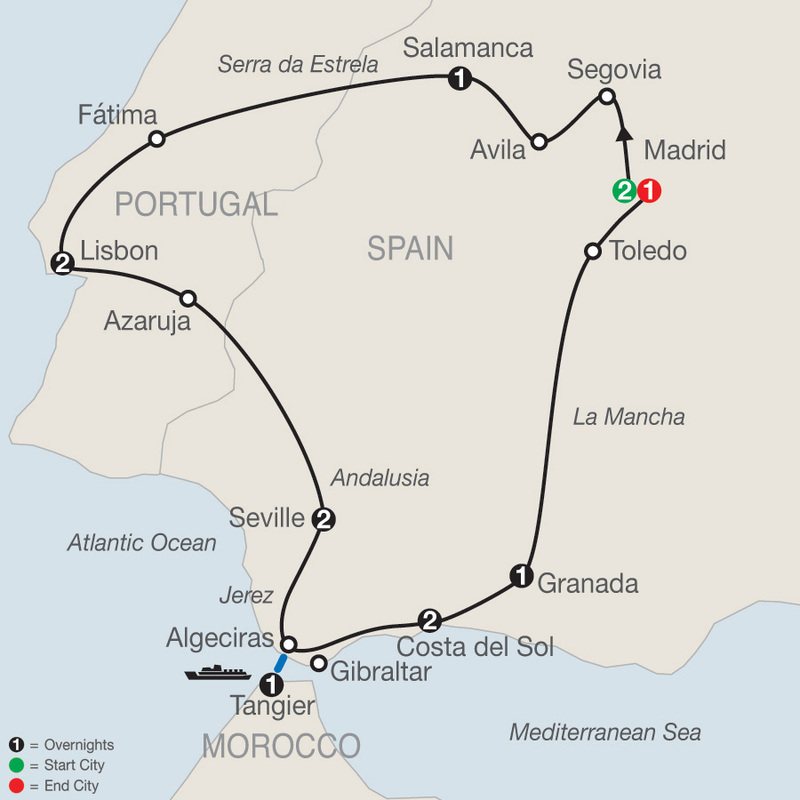 This fantastic Spain, Portugal, and Morocco tour concentrates on the southern part of the Iberian Peninsula. On this vacation, there is ample time for in-depth sightseeing, and you’ll visit many of the area’s historic sites, including the Casa de Pilatos in Seville, with its ...Read More. 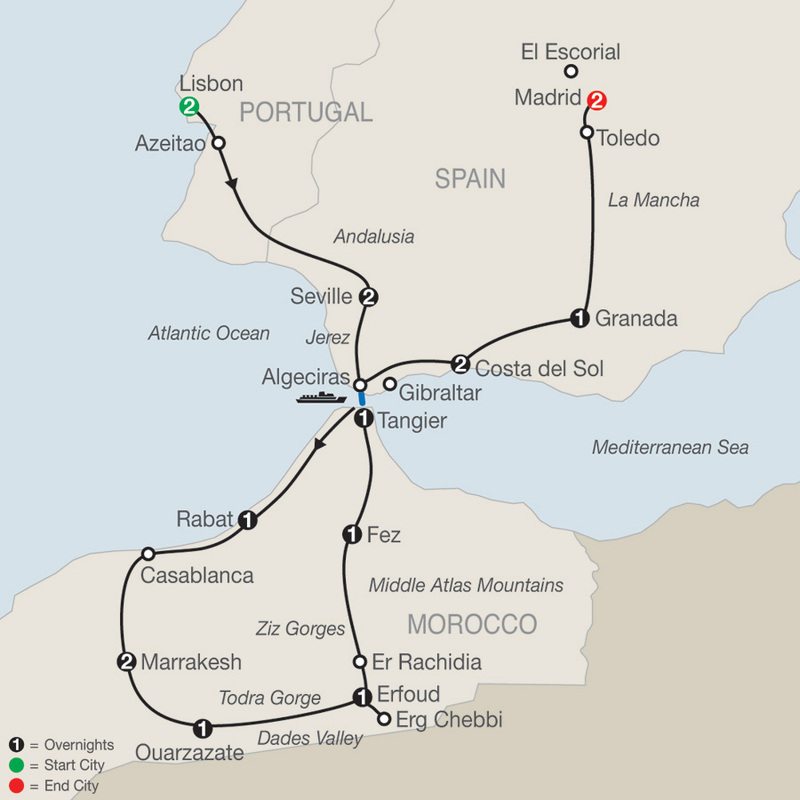 On this Spain, Portugal, and Morocco tour, you’ll experience these three glorious countries, each with a rich history and culture! 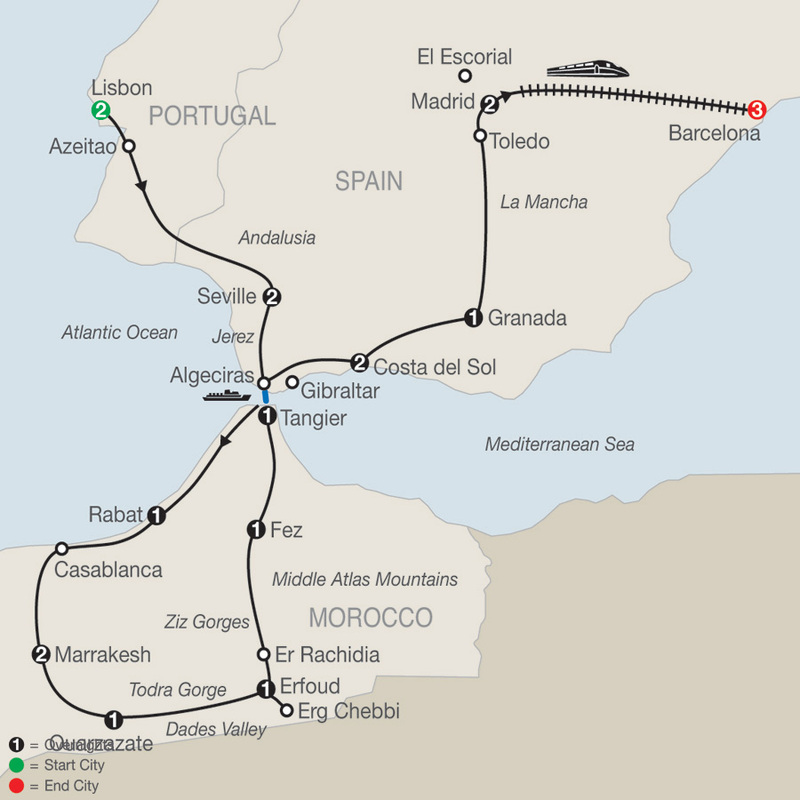 You’ll overnight in Lisbon, Seville, Rabat, Marrakesh, Ouarzazate, Erfoud, Fez, Tangier, the Costa del Sol, Granada, and Madrid. Tour highlights ...Read More. 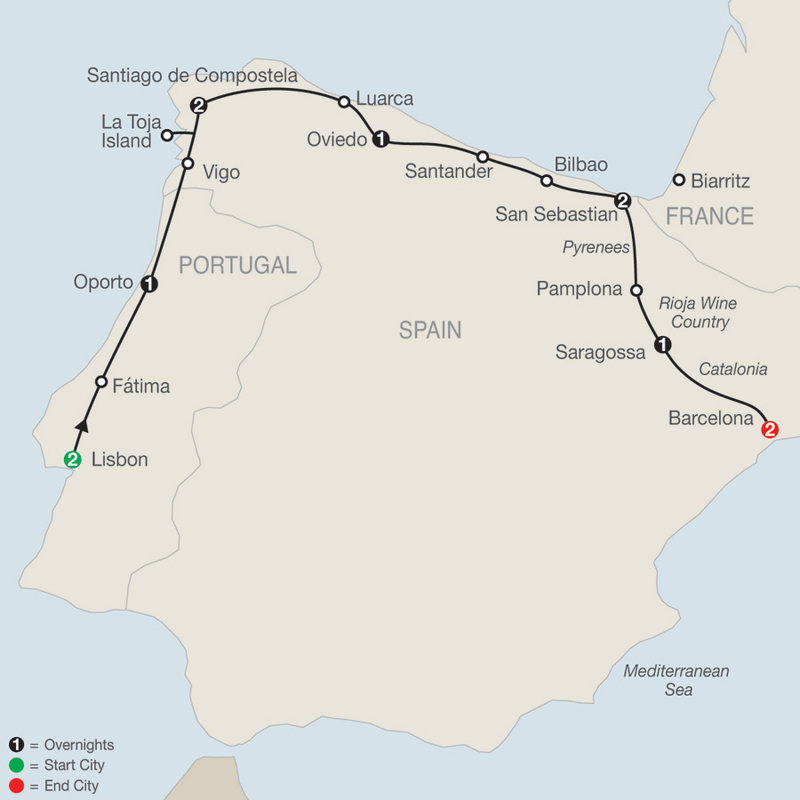 Explore the coastline of Portugal and Northern Spain on this fascinating vacation. 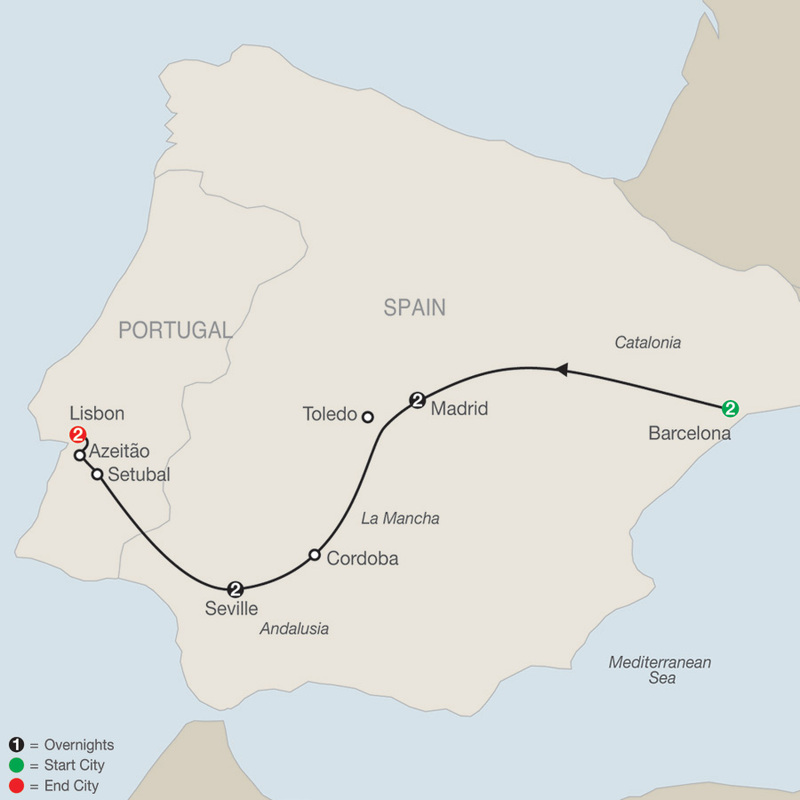 In Portugal, you'll overnight in Lisbon and Oporto, and enjoy guided sightseeing in both cities, including Lisbon’s Jeronimos Monastery, dating back to the 16th century, and in Oporto, the Arabian ...Read More. 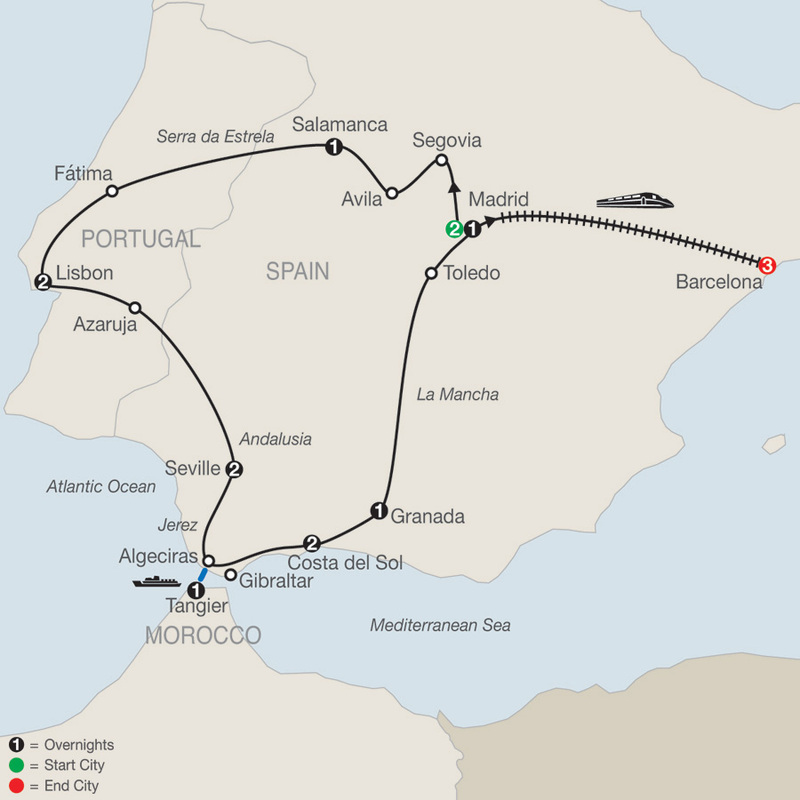 On this Spain, Portugal, and Morocco tour, you’ll experience these three glorious countries with overnights in Lisbon, Seville, Rabat, Marrakesh, Ouarzazate, Erfoud, Fez, Tangier, the Costa del Sol, Granada, Madrid, and Barcelona. Tour highlights include the Jeronimos Monastery ...Read More.